Thousands of years ago, three Mother Boxes, which could grant untold power to anyone in possession of all three, were hidden. One was to be guarded by the Amazons, one by the Atlantians, and one by humans. This was done to prevent Steppenwolf (Ciarán Hinds) and his army of demons from collecting all three and taking over Earth. With Superman’s (Henry Cavill) death, the Mother Boxes have become active again, summoning Steppenwolf to renew his quest to get them. After encountering some of the demons, Bruce Wayne (Ben Affleck) realizes a threat is coming. He contacts Diana Prince (Gal Gadot). They decide now is the time to reach out to some potential allies they discovered in the files they stole from Lex Luthor (Jesse Eisenberg). Bruce heads out to recruit Barry Allen (Ezra Miller). As a result of a lightning strike – or something like that – Barry was granted with super speed. After Barry agrees to join the team, Bruce heads north to persuade Arthur Curry (Jason Mamoa), also known as the Aquaman. Meanwhile, Diana tries to convince Victor Stone (Ray Fisher) to join the team. An accident had left him in critical shape. Victor’s father Silas (Joe Morton), who works for Star Labs, had augmented Victor’s body with technology that has left him with constantly evolving technology. With the team assembled, Bruce and Diana try head out to stop Steppenwolf before he can acquire all the Mother Boxes. Without Superman, they may not be able to stop him. Justice League is DC Extended Universe’s first official movie assembling their team of superheroes. With the collection of films they’ve released so far, I had my concerns going in. I was hopeful, however, that they had taken notes from Gal Gadot and Patty Jenkin’s super successful Wonder Woman. I like Henry Cavill as Superman. He fits the character well. I’m even ok with Ben Affleck as Batman. I don’t know that he would have been my first choice, but he’s fine. Gal Gadot is easily the best choice DC has made so far. She has a quality about her and her character that the others in the film can’t quite match, even if she loses a bit of what made Wonder Woman so good. As for the newcomers, Jason Mamoa is great as Aquaman. His persona shines through as what is probably the most questionable of DC’s superhero catalog. He makes it work though, not without a few jabs at his powers from Batman. I just wish they had done a little more with him. Ray Fisher is fine as Victor Stone/Cyborg. I’m not familiar with the character, but Fisher isn’t bad in the role. Ezra Miller is no Grant Gustin. I understand the complications it would cause using the actor from the Flash TV series in the movie universe, but that is the Barry Allen most of us have come to know. At times, Miller tries to hard to be the goofy guy and it becomes a little off-putting. Justice League tried to take notes from Wonder Woman. It also tries to take something from the Marvel franchise, easily done since Joss Whedon, who directed both Avengers movies, joined the film after Zack Snyder stepped away from the film to deal with a family tragedy. However, you can still see Snyder’s heavy hand all over the film. They leaned so heavily on Marvel, not only for the humor aspect, but the Mother Boxes and their combined power feels almost identical to the Infinity Stones that have been the focal point of the Avengers and its spinoffs. Steppenwolf is almost a direct copy of Thanos. Even Steppenwolf’s army of flying monkeys feels like the hoard of aliens attacking Earth in the first Avengers movie. I had high hopes for Justice League after seeing what their success earlier this year and with Joss Whedon coming onboard. Those hopes quickly fell flat. Part of this may be seeing the film after Wonder Woman and ,more recently, Thor: Ragnarok. Those films set the bar too high this year for Justice League to have a chance. 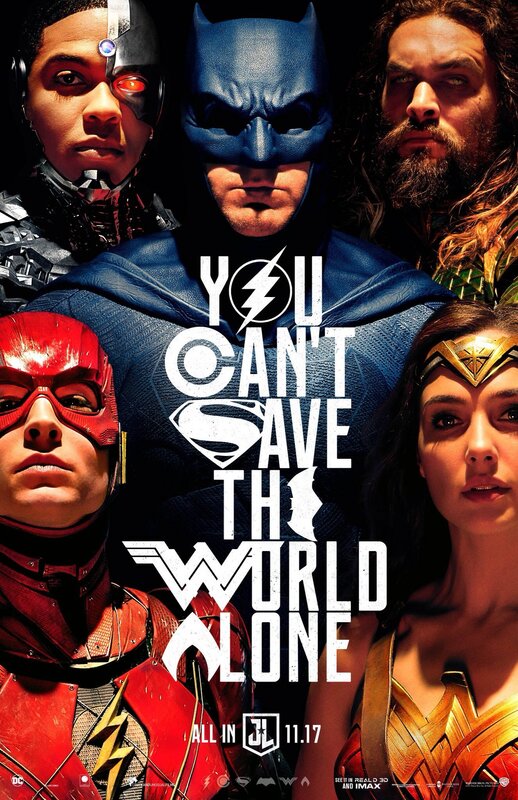 My mixed recommendation on this film: If you are a fan of Zack Snyder’s interpretation of superhero films, you will probably enjoy the movie. Otherwise, it is a disappointment. If you are going to see it, which I would say is a questionable decision, see it in the theater so you can take in all the action. If you can wait for the rental, you won’t regret paying theater prices to see it.